In 1856, the young artist Viktor Madarász (1840-1917) displayed a strange painting at the exhibition of the Art Society in the city of Pest. 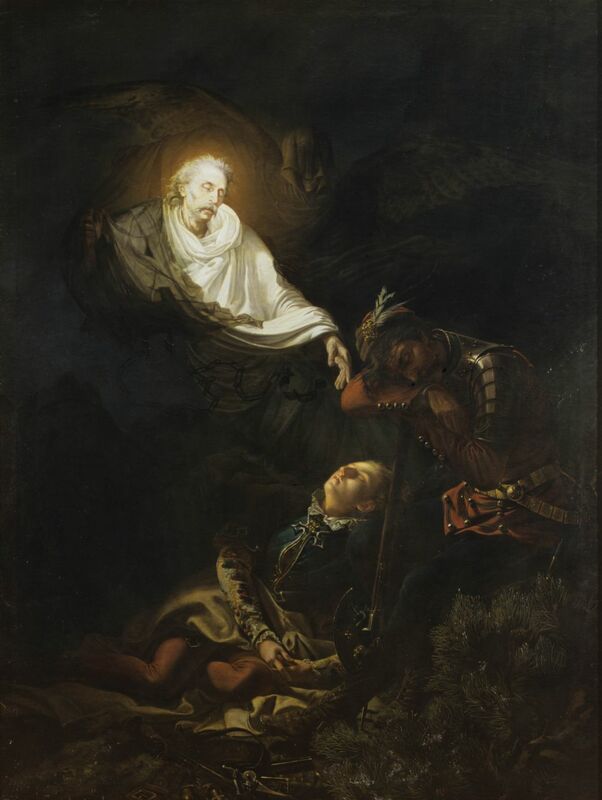 The large canvas bore the title The Dream of the Fugitive during the War against the Turks, and showed a young man and a soldier sleeping while two ghostly apparitions – an old man in chains, dressed in white, and a horrid, dark, winged figure with a cape and a skull-like face – hover above them. The painting received much attention from the critics, who did their best to try to interpret it. A month later Madarász helped them out by hanging an explanation next to the painting. As it turned out, the title – which mentions no specific person and refers to the war against the Turks – was only a ruse to avoid censorship: the real subject of the painting was the struggle against Austrian rule. The sleeping youth was none other than Imre Thököly (1657-1705), the future leader of an uprising against Austria, who had just fled from his family’s castle – under siege by the Austrians and defended by Thököly’s father, a rebel himself. Thököly the elder had died that night, and the picture shows his ghost appearing to his son in a dream. In 1856, Hungary was still a province of the Austrian Empire, and the emperor’s army had just defeated the Hungarian revolutionaries in the War of Independence of 1848-1849. No wonder Madarász feared censorship (the arbitrariness of which is demonstrated by the fact that it was possible for him to hang his text next to the picture; what is more, one of the newspapers published it – this is how we know about it). Today, The Dream of the Fugitive counts as a history painting, one of the many depictions of national history produced by Hungarian painters in the second half of the 19th century. 19th-century critics assigned a vital role to these paintings: they were supposed to help forge a community by addressing the nation as a whole and representing significant events of national history, while also conveying ‘national character’. But did The Dream of the Fugitive, with its unrealistic subject and blood-curdling imagery, satisfy those demands?